For over 100 years the Royal Liver Building, with it’s iconic clock towers and famous Liver Birds, has dominated the Liverpool skyline. World-renowned and fiercely loved by the locals whose home it represents, the Liver Building has nevertheless remained elusive, open only to those who have had the privilege of working within it’s walls. The Venue opened in 2014, for the first time giving the public the chance to host their special occasions in the building that means so much to them, quickly becoming popular for city Weddings and exclusive corporate events. Still, the inner nooks, lofty upper floors and rich hidden history of the building have remained a mystery to those outside. 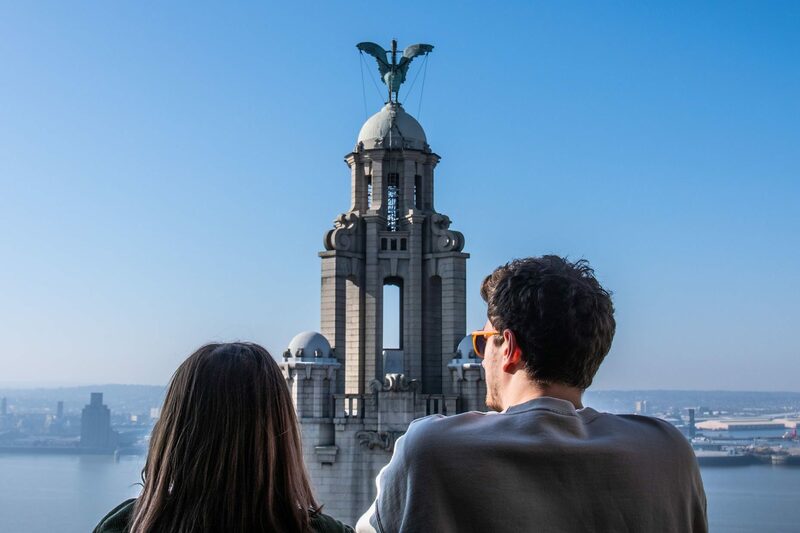 RLB360 have finally opened Liverpool’s favourite landmark to the public with their ‘Icon Unlocked’ experience, the latest tourist attraction to open in Liverpool and what we foresee to be one of the most successful in years to come. In March The Venue team were lucky enough to be invited to preview the new attraction and were greeted by an unexpectedly moving experience. The RLB360 tour begins on Water Street, venturing down into the lower ground floor visitors centre before climbing up to the Clock Towers and above for unparalleled views of Liverpool’s skyline. Within the walls of the clock towers, we were treated to a world-class digital projection show amongst the clock mechanisms depicting the history of Liverpool, a true highlight of the tour. Far from the traditional museum vibe the tour is exciting and full of interesting facts complimented by spectacular views and emotive experiences. Whether you are local or visiting Liverpool, this experience is an absolute MUST for your itinerary. The experience launched on 1st April 2019, with Gerry Marsden catching the Ferry Across the Mersey to officially open the doors before attending a VIP reception at The Venue.